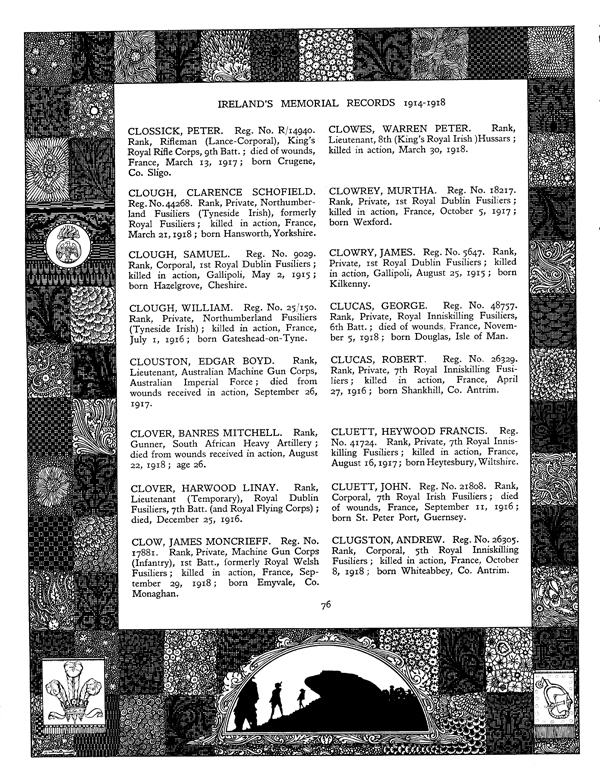 Nancy Clowry/Clowery – Wexford, Memorials of the dead. 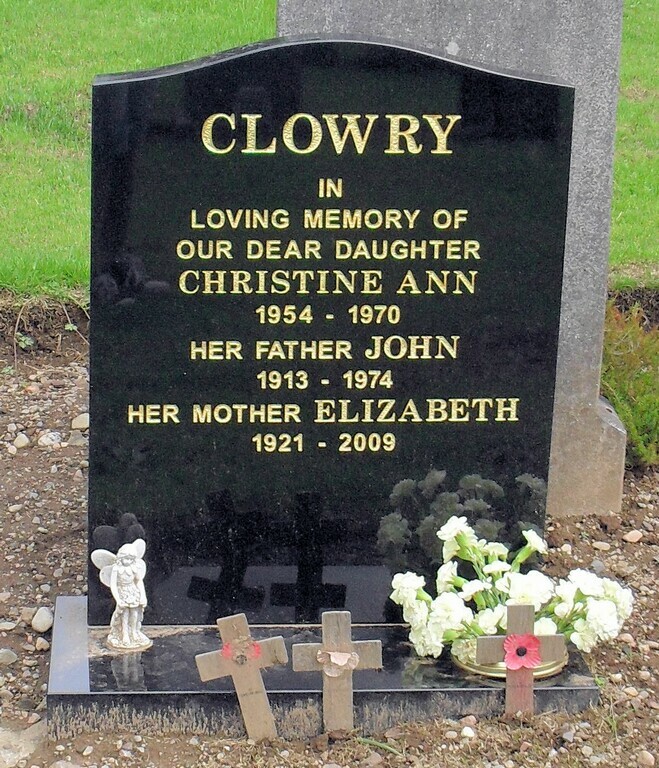 In loving memory of Nancy Clowry died 23rd March 1955 and her husband Peter died 4 Oct 1963. (Partly repeated in next note variation in spelling of surname). 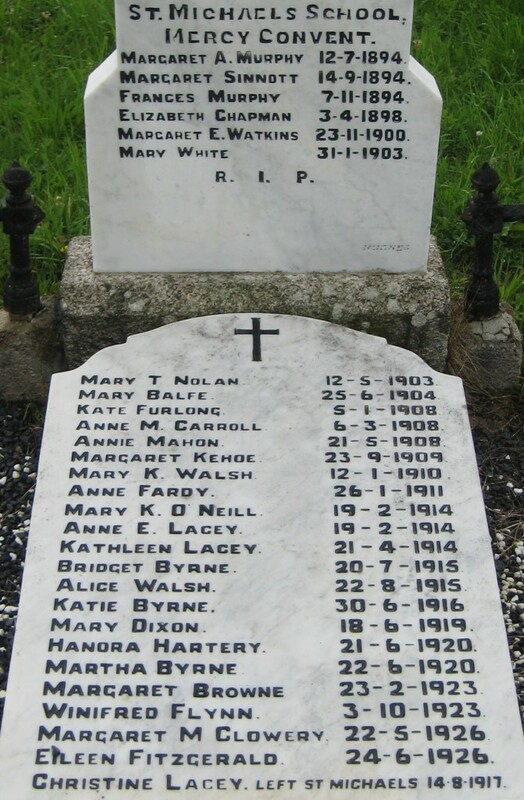 In loving memory of Annie O’Grady/Carrigeen St. died 5th July 1938/aged 56years also her daughter.Nancy Clowery died 23rd March 1955 aged 34 years. Source: N/A. Please let me know if you provided this. Clowrey, Murtha. Reg Ni 18217. Rank, Private, 1st Royal Fusiliers; killed in action, France, October 5, 1917 born Wexford. Clowry James. Reg No 5647. Rank Private 1st Royal Dublin Fusiliers; killed in Action, Gallipoli, August 25, 1915; born Kilkenny. 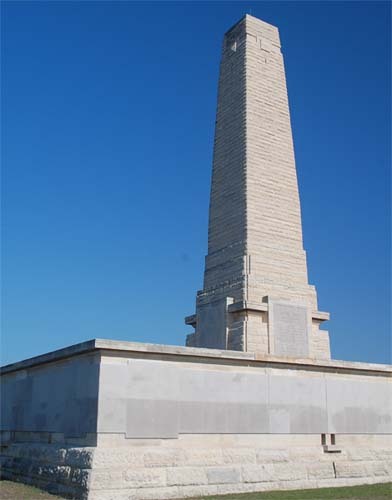 Contains the names of 474 Dublin Fusiliers who died in the Gallipoli campaign. Place of Birth: Kilkenny, Lived in Kilkenny enlisted in Carlow. Policeman Clowry died of a wound he received on November 21st, 1932, when he was shot in the head by bandits he caught robbing a building and loan at Richmond Street and Indiana Avenue. 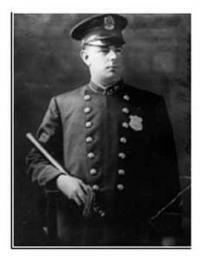 Patrolman Matthew Clowry was detailed to guard a meeting of the Commonwealth Building and Loan Association on the evening of November 21, 1932. Shortly before nine o’clock, three masked and armed men burst through the doorway and shouted “Hands up!” Looking straight at the barrels of two revolvers and a sawed off shot gun, only ten feet away, Patrolman Clowry disregarded the call and reached for his own revolver. At the same instant two of the bandits shot point blank at his head and both a revolver bullet and the charge from the gun struck the front of his cap and inflicted a bad scalp wound above his right eye. Stunned by the shot, the patrolman fell, and although semi-conscious while another bandit stood over him, he tried to pull his gun on the gang as they ran from the building with the stolen cash. He succeeded in shooting once at the five bandits as they left in an automobile and then went to a Police Signal Box to report the hold-up, at which point he collapsed from wounds and loss of blood. The suspects were later captured because of a description given by Policeman Clowry. David Almeida and four others were caught in the holdup. The others pleaded guilty and went to jail, but Almeida, accused of driving the gang’s car stood trial and was acquitted. The court thought so little of the verdict that it placed Almeida under $5,000 bail to keep the peace. Almeida went on to commit other bank and commercial robberies and was imprisoned for life after the murder of Philadelphia Police Officer Cecil Ingling in 1947. Policeman Clowry had served with the Philadelphia Police Department for 22 years. He was survived by his wife and four children. Margaret is buried in the communal convent plot. Photo of the headstone attached. The death took place in Sudbery, Suffox, England, of Agnes Clowry (nee Hough), formerly of Feemore, Borrisokane and Ballinderry. To her family, relatives and friends sincere sympathy. This branch originated in Enniscorthy when John Clowry(c.1849-1896) married Mary Kennedy(c.1851-d) in Oulart, Enniscorthy, Wexford. 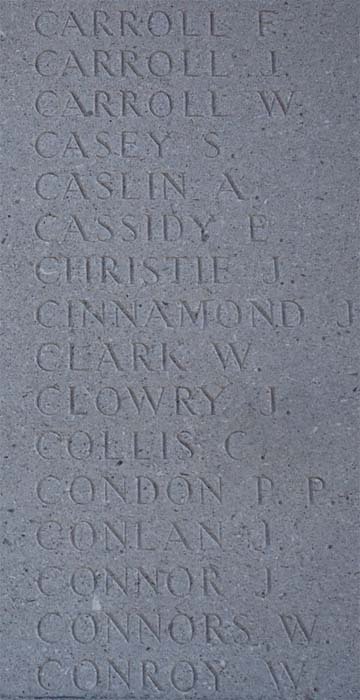 John Clowry’s father was also named John and it is unknown if he was born in Carlow or Wexford. 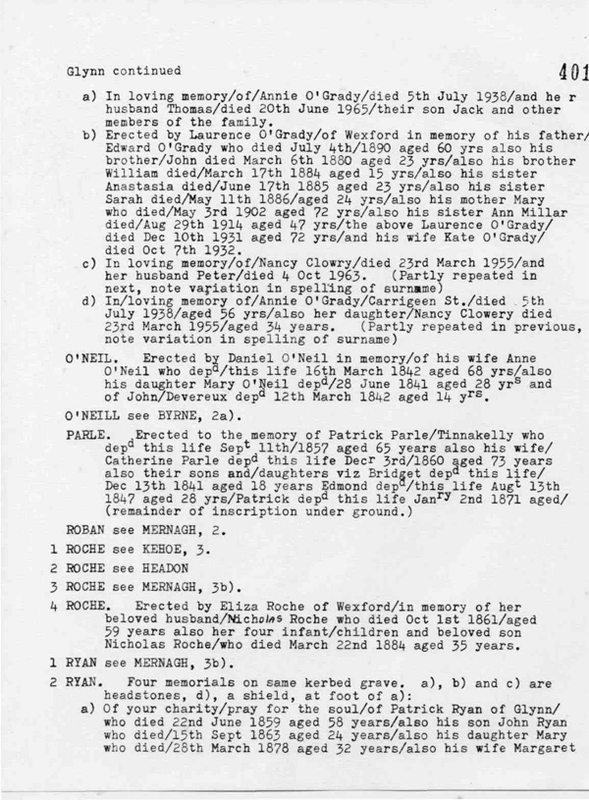 Most of the Clowry children died and the tree died out in Ireland. (Death:)Matthew Clowry and Mary Ellen James, Mary Kennedy Clowry. Need to find John Clowry 1849 birth certificate. This branch originated in Maudlinstown, Wexford. The earliest Clowry that can be found in this tree is Peter Clowry(c.1813 – c.1882) his wife is unknown. It is also unknown who Peter’s parents were and if he had any brothers or sisters. There are still relatives of the tree living in Wexford but some moved to the US and UK in the early 1900’s. Over time the surnames seems to have changed to Clowery in Wexford. Questions: Branch WEX01 : Maudlinstown to UK,Scotland, USA. Peter 1813 – 1882 married unknown and had John 1838 and Philip 1840. Possibly had other kids. Needs to check wexford parish records. Ellen Clowry(born 1880-1895), had John Clowry as child in 1913 possibly in the UK. Don’t know when she was born or John’s fathers name. Possibly related to the Murtagh and Penders in Wexford. The 1901 and 1911 Census provided vital information on Clowrys around the start of the 1900s. The National Archives of Ireland has digitised the 1901 and 1911 Census of Ireland and it can be searched here: http://www.census.nationalarchives.ie/ In terms of Clowrys in the 1901 and 1911 Census, you must remember to search not only for the surname “Clowry” but also for misspellings such as “Clowery, Clowrey, Cloury, Clowey, Clowny, Cluwey” etc. As mentioned in the main article: Clowrys in Irish Census, there are a number of Clowrys in Wexford in the 1911 Census.They are located in Green Street, Stonebridge Lane, Barrack Street, Clifford Street, King’s Street, Bride Street, Maudlintown and Coolroe. View more detailed information below. As mentioned in the main article: Clowrys in Irish Census, there are a number of Clowrys in Wexford in the 1901 Census .They are located in Green Street, Stonebridge Lane, Patrick Street,Bride Street, Maudlintown, Ballymackesy(Clonroche) and Ballyheige(Ardcolm). The majority have their name spelled “Clowery”. View more detailed information below. I have been working on a worldwide Clowry family tree. So far I have 30 branches which I am trying to merge together. The branches are held on the geni.com website. You need to have a free account to access these trees and also you may need to be part of my family group. Either way if you are having problems with the links below, please let me know. In my previous post, Clowrys in Irish Newspapers – Part 1, I stated that I would upload all of the Clowry Irish Newspaper articles. Richard John Griffith conducted a tenement survey which valued individual property separately for the first time in Ireland. The survey valued all buildings in the townland for the first time, whereas, before only the larger houses, principally those of the gentry had been valued in the first valuation. The tenement valuations of County Dublin were the first to be published on 5 May 1853 and the last were the valuations of County Armagh on 1 June 1865. The valuation is a vital document in genealogical research, since in the absence of census records in Ireland before 1901 the valuation records in many ways can act as a substitute. In terms of Clowry’s in the Griffith’s Valuation, the majority are based in Carlow, one in Castledermot and two Clowry’s is based in Wexford. The Carlow Valuations were completed by 28 June 1853 and the Wexford Valuations were completed by 7 July 1854. Newspapers archives can contain a wealth of information for family history. For a small fee(usually €10) you can get access to old newspaper articles online.